Whiteghyll specialise in the design and manufacture of POS and Visual Merchandising display products, alongside nationwide onsite installation. Very strong working relationship with Paperchase which spans over 10 years. We manufacture instore acrylic displays, ranging from book stands to acrylic display cubes. Our display products can be seen in their 130+ stores across the UK and Worldwide. 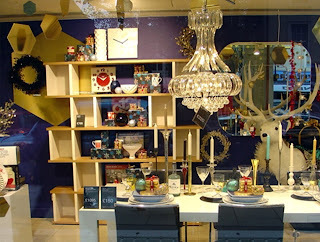 We are also called upon to produce seasonal bespoke window displays for Christmas and other seasonal events. These can be viewed in their flagship stores in London and Manchester. 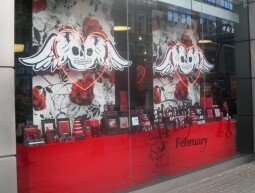 The brief was to manufacture and deliver a bespoke window display for Valentines Day 2011 using supplied Gothic themed artwork. Using the supplied artwork from Paperchase, printed and used CNC machine to cut to shape large skull themed prints onto Foamex. These were over 2 meters wide and used to hang in-store and within the window display at Tottenham Court Road. Brief to work alongside Heal's design and development team and create a multi purpose window scheme for the pre and post Christmas season. Ensure all display panel backdrops and central floor display units will incorporate furniture and retail merchandise. Window graphics were designed and produced to allow all in-store products to be clearly viewed. All window, back panel and central floor unit graphics were produced in house using Graphtech FC1200 plotter, then distributed and installed by the Heal’s team. Produce working samples to coincide with the initial ideas that Ann Summers had been briefed on. Required to work closely with Ann Summers to choose the elements that work more effectively with the look that was desired and which would prove to be commercially viable. All products to promote the Knickerbox re-brand. Brief was to manufacturethe majority of the in-store and window point of sale for Ann Summers’ 130 UK stores. This included large format backing panels which were screen printed, CNC cut and then heat bent to form 3D butterfly shapes. Large and small window graphics and various in-store point of sale products to promote the re-brand were also produced to ensure maximum exposure of the re-brand. All products were packed in-house and distributed by the skilled Whiteghyll finishing team to ensure that all products reached the 130 stores in perfect condition.